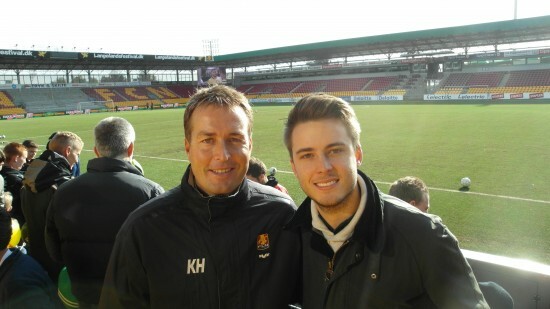 The story of FC Nordsjaelland is the stuff Hollywood scriptwriters would struggle to conjure up. Ten years on from gaining promotion to the Danish Superliga, after years of financial and political scandal, the small club from the sleepy North Zealand town of Farum in the suburbs of northern Copenhagen won its maiden league title. How they achieved this feat, against the might of Danish powerhouses such as FC Copenhagen, is a true testament to the art of playing football in ‘the right way'; an attacking philosophy that finally bore fruit after years of being sarcastically labelled the ‘Danish Barcelona’. In order to quantify the achievements of Kasper Hjulmand’s men last season, it is necessary to take a look at their brief history as a football club. First formed in a merger between Farum IK and Stavnsholt BK in 1991, the club (at this point known as Farum Boldklub) gradually rose through the lower leagues under the suspicious economic and political support of progressive Peter Brixtofte, who was both the town mayor and the club’s chairman. Using tax-payers money to finance transfers and a new stadium (for a club renowned for having a meagre fan-base) in order to support his overtly-ambitious plans for the club, Brixtofte’s dodgy dealings eventually landed him in jail, and in the process plunging FC Boldklub to the brink of administration. In exchange for sponsorship money towards the club, Brixtofte had used his position as Mayor to sign hugely inflated deals with private companies to provide social services. Yet despite their off-field issues and after a string of managerial sackings, the ‘Wild Tigers’ finally gained promotion to the Superliga in 2002. 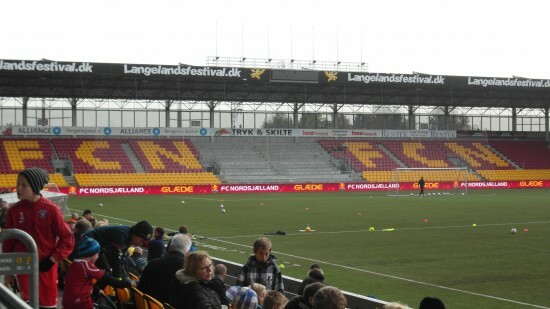 The timely intervention of businessman Allan Pedersen saved the club from financial ruin; changing the name of the team to FC Nordsjaelland (FCN) in 2002 was an attempt to appeal to the regional area of North Zealand and usher in a new era for the club. Perhaps the most crucial action taken under the new ownership was the establishment of Fodbold Samarbedje Nordsjaelland (FSN), a regional collective of clubs focused solely on the development of young players. In an system that echoes the use of ‘feeder clubs’, in exchange for offering free tickets, sponsorship and organising friendlies, FCN get first choice on any promising players coming through the ranks across the network of 70 partnering clubs. It is an ingenious system that should provide FCN with great long-term stability. Under the stewardship of former Celtic midfielder Morten Wieghorst and the goals of Morten Nordstrand, FCN began to impose themselves on the Superliga in the latter half of last decade, yet off-field problems would continue to plague the team. In 2008, Pedersen sold the club to himself from his holding company for a fee later discovered to be 76 times lower than the true value of the club. Many observers predicted the on-running off-field issues would de-stabilise the club after it had finally established itself in Denmark’s premier league, yet back-to-back victories in the Danish Cup final in 2010 and 2011 suggested otherwise. Despite these cup successes, FCN’s title success in the 2011/2012 season took everyone by surprise. In inexperienced manager Kasper Hjulmand’s first season in charge, it was widely assumed that the man who oversaw both promotion and instant relegation from the Superliga with Lyngby would struggle to produce consistent results for the perennially-inconsistent Wild Tigers. Arguably, however, the 39-year-old was the perfect fit for a club who had begun to enjoy the winning feeling on the back of those back-to-back cup wins. A brilliant motivator intent on continuing the club’s tradition of producing attacking, attractive football, Hjulmand favours a fluid 4-2-3-1 system with a focus on maintaining possession of the football. Yet to win your maiden league title with such positive attacking intent is clearly a fantastic achievement. Unknown players such as Jores Okore and Andreas Bjelland ended the season as household names in the Euro 2012 Danish squad – a true testament to the startling rise of the club. Suddenly, from relative obscurity, the team with ‘no supporters’ (less than 5,000 attend home matches) and no star players were the toast of Danish football. Imagine if Wigan, for instance, were to get into the ‘Top 6′ in the Premier League? FCN’s baptism of fire in the Champions of League has not been without its positives, despite accruing nil points from the first two games. 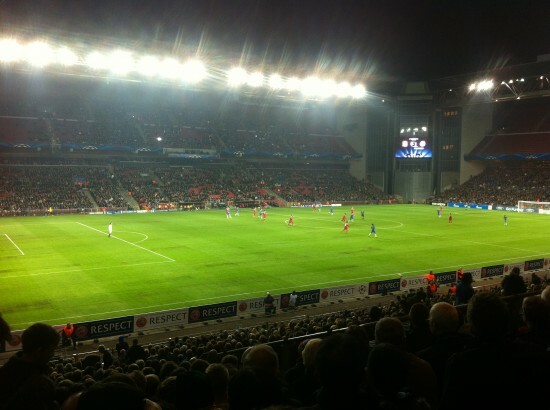 After dominating in Donetsk only to concede two sloppy goals on the counter-attack, FCN outplayed Chelsea in Copenhagen’s PARKEN stadium (as their 10,000 seater, artificial Farum Park stadium was deemed too small) for long periods of the game. It was a joy to witness young players sticking resolutely to their attacking principles against their more illustrious opponents, with Okore their stand-out player, and arguably it was only the right fingertips of Petr Cech tipping the impressive Joshua John’s curling effort onto the post at 0-1 that swung the game in Chelsea’s favour. Certainly, the 4-0 scoreline was, in this writer’s opinion, a bit of a footballing travesty. Accordingly, FCN approach tonight’s game with Italian giants Juventus in a confident mood. I had a chance to chat with Hjulmand, Joshua John and towering centre-back Ivan Runje at an open-training session the club held last week at their remote Farum Park stadium. The free event was a chance for the large proportion of younger fans to watch the team train, get autographs from the players and to play a bit of FIFA 13 (always important of course). In the opinion of this writer, it was refreshing to see any club, not least the current Danish champions, be so open to its supporters, and I gained the impression that the FCN community was a strong one. Hjulmand described the mood in the Nordsjaelland camp as “comfortable” and that they were “looking forward to the Juventus game”. Runje, who will be tasked with nullifying the threat of Giovinco and Vucinic, noted the challenge would be “tough like the Chelsea game”, whilst leading scorer John bemoaned his side’s luck against Chelsea and was excited about testing his abilities against the famously watertight Juventus rearguard. Undoubtedly, FC Nordsjaelland’s Champions League experience will stand them in good stead and help cement themselves as a force to be reckoned with in the Danish Superliga. The threat of losing their best players will of course be an issue – Okore has been watched by several European giants and Joshua John is only on loan from FC Twente – yet the FSN provides the club with a vast array of replacements for them to cherry pick. Whilst their small stadium, tiny fan base and shortage of funds may pit the odds against them, Hjulmand’s exciting brand of passing football may be just enough to win over a legion of new fans. Besides, who doesn’t like an underdog? This entry was posted in Analysis and opinion and tagged 'Danish Barcelona', chelsea, Copenhagen, Danish Superliga, Farum, FC Nordsjaelland, jores okore, joshua john, juventus, Kasper Hjulmand, parken, the bridge by Josh Dishman. Bookmark the permalink.